Here in Paris, you’ll find different restaurants serving kosher food. I made a list below of my favorite ones. I am sorry to tell you that some of the restaurants write by hand : “Casher” on their boutique when the food is not “casher”. 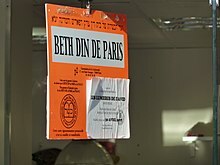 This bright orange sign in comes from the Beth Din of Paris, which is regulated by the Consistoire : major Jewish organisation in France. This is kosher, but Not Glatt Kosher. Important Note : Some Restaurants in Rue des Rosiers, put the David Star on their storefront or a Mizouza in the boutiques, but this does not mean they are Kosher. Also, They are often open on Sabbath and in holidays. French style, Kosher restaurant in the beautiful street of Rue des Ecouffes. Very tasty food. French style, Kosher restaurant, a bit more expensive than the others. Prestigious and fancy. If you go to As de Falafel, and wait in line, some of the boys will ask you to pay in advance to make the line quicker but actually it is a trick to make you stay in line and not change your mind. In my opinion, I would never wait for one hour for this falafel even though trip advisor says the best about it. I tried this restaurant many time with my family. you can also pre-order for shabbat with this little tunisian restaurant. Great service, large choice of pastries, sandwiches, quiches, bagels and great coffee place. They offer both sephardic and ashkenazi pastries ! This is a bakery that you can not miss in Rue des Rosiers. The most beautiful Jewish bakery in my opinion as the owners, originally from Morocco, kept the french ornaments inside, like the in the 19th century. I am a Licensed Tour Guide specialized in the Jewish Walking Tours in Paris and private museum tours like the Louvre, Versailles & Orsay, for example, since I was 22. I am licensed by the state after studying History and Art at the Sorbonne University for 5 years. 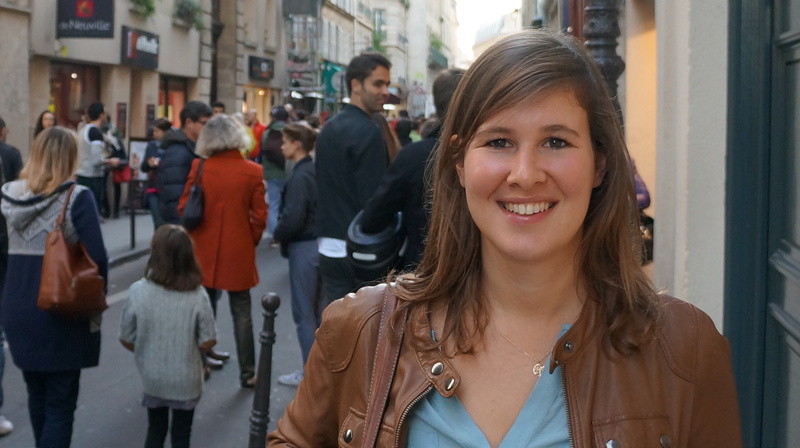 I was born and raised in le Marais, so the Jewish neighborhood of Paris is my Home : I am the granddaughter of Joe Goldenberg, owner of a famous restaurant in the Pletzl. As my mother is a tour guide as well, she inspired me in my work. We designed together the Jewish Walking Tour of our beautiful neighborhood. I organize visits inside the synagogues. We will discover the Jewish shops, bakeries, bookstores. The tour can include a visit of the Holocaust memorial in the end. After the tour you can stay in Le Marais for lunch, and maybe try the famous best falafel or the new trendy Jewish restaurants in Rue des Rosiers. *For Families with Kids and Teenagers in Paris : I prepared games, questions and treats for children.